With recent articles saying that 85% of users promptly ignored the Windows 8 Start screen and sought the relative refuge of the desktop, many pundits have been proclaiming Windows 8 a total failure. It certainly doesn’t help that Stardock’s Start8 is one of the consistent top ten sellers at the Windows Store; it’s a wag of the finger to Microsoft when the number one app is one that replaces the Start screen with something more comfortable. There are so many bad quotes about Windows 8, it’s beginning to seem like too easy of a target. For my part, I’ve been using Windows 8 since its retail launch. I still don’t use it on my primary PC, I’m not quite that bold and it’s taken me a while to get my computer just how I like it. But I have it on a secondary PC I use every day. First of all, unless you’ve been hiding under a rock you have read numerous articles about how abysmal it is to use Windows 8 without a touch screen. Honestly, that’s the first impression I had too. But I’ve found some workarounds, and there certainly are a lot of keyboard shortcuts if you’re willing to learn them. It’s still no thrill but honestly it’s workable. I do spend most of my time in the desktop environment, for several reasons. First of all, I like Chrome far better than Microsoft’s IE10 browser. That browser is definitely a step backwards for me. I finally figured out how to create multiple tabs but switching to them is a massive pain and you can’t open more than one at a time. Chrome does this with ease. Also, I need multiple windows. I need a desktop. I need a place to put my temporary stuff and I need to launch several apps at once and switch quickly. The new Windows environment just doesn’t do that. I start apps by clicking on them in the quick launch bar. I start less-used apps by typing their name in the start menu. I check my battery life. Some of these tasks are marginally harder than they used to be, requiring a point-and-hold to the right of the screen (or keybooard shortcut) rather than a quick push of the Windows button. But the loss of the clock is a bit of a blow. I’ll put a clock back on my “real” desk, I suppose. I just think it’s stupid that Windows 8 shows me my name and picture all the time (I know my name) and doesn’t show me the time, something I’m not likely to know. No, the biggest problem with the Start screen is its biggest “improvement” — live tiles. Every time something animates it gets my attention and stops me from doing what I was doing. That’s a huge blow to my productivity and I had to turn that off in order to keep the start screen active for app launching. 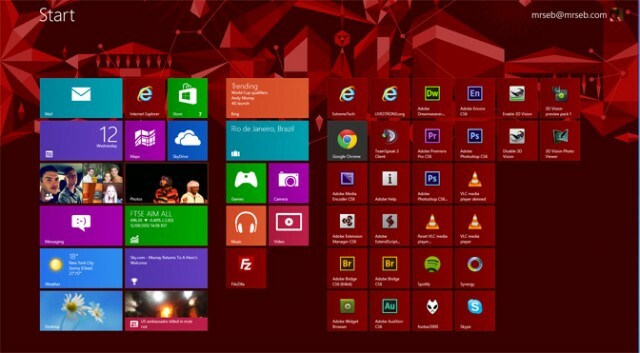 Windows 8 starts faster and resumes faster, and it actually executes Windows 7 apps faster too. It’s slow to launch the newer apps but who knows how to compare that? In fact, the only newer app I use is Mail. Yes, it’s a terrible client. It really is. I stick with it largely because I’m a masochist. Web mail is so much better and Outlook,with all its flaws is a million times better (and faster too.) If ever there was an app that demonstrated the need for multiple windows it’s Mail. Here’s something that Apple continues to get astoundingly right and Microsoft continues its long history of fails. So, it’s not a total waste. If I had to move over to Win8 for work, I would. Of course, 92% of businesses surveyed say they have no Win8 adoption plans for the next 18 months, so I’d be in the minority. I’ll tell you this though, if I did do it, I’d have a touchscreen laptop with a modest, perhaps 15″ monitor, and a 27″ screen for the desktop. Is that really what Microsoft envisioned?